A note on Ambien and GERD association! Zolpidem (Ambien) dramatically increases the new event and duration of gastroesophageal reflux (GERD)., Patients with established diagnosis of GERD had reflux events measured to be significantly longer when taking zolpidem than on placebo. Proposed mechansim of action: This is assumed to be due to suppression of arousal during the reflux event, which would normally result in a swallowing reflex to clear gastric acid from the esophagus. Long term effect includes development of esophageal cancer. Reference: Gagliardi GS, Shah AP, Goldstein M, Denua-Rivera S, Doghramji K, Cohen S, Dimarino AJ (September 2009). "Effect of zolpidem on the sleep arousal response to nocturnal esophageal acid exposure". Clin. Gastroenterol. Hepatol. 7 (9): 948–52. Reference: J Clin Aesthetic Dermatol. 2009;2(10):37–40. Diphenhydramine hydrochloride (DPH) has numerous pharmacological uses in medicine. It is a first-generation, sedating, oral antihistamine. When topically applied, DPH has excellent anesthetic and antipruritic effects. DPH has also been shown to be an effective injectable drug for local anesthesia. This may be due to its three-dimensional structure, which is similar to other anesthetic drugs. The authors present a patient whose history of a severe “allergic” reaction to a “caine” local anesthetic prompted the use of 1% DPH to allow same-day surgery and avoid any possibility of a potentially life-threatening reaction." Q: What is Sepsis 6? Measure serum lactate and send full blood count. Commence accurate urine output measurement. Five years after the international Surviving Sepsis Campaign (SSC) care bundles were published, care standards in the management of patients with severe sepsis are achieved in fewer than one in seven patients! Application of sepsis six along with SSC resuscitation bundle showed remarkable improvement. Study data from 567 patients showed that 84.6% of those receiving the sepsis six (n=220) achieved the resuscitation bundle compared with only 5.8% of others! A: Talcosis refers to emboli of talc, starch, and cellulose, and are seen almost invariably in chronic intravenous drug users. When injected, talc produces a giant cell granulomatosis of the pulmonary arterioles, thats why also known as Talc granulomatosis. Some of the oral medications such as amphetamines, methylphenidate, hydromorphone, and dextropropoxyphene are ground by drug users, mixed in liquid, and injected IV. Talc (as magnesium trisilicate), starch, and cellulose, are used as fillers in these drug and causes Talcosis. Talc and other particles reach small pulmonary arterioles and capillaries where a foreign body giant cell granulomatous reaction occurs. Chronic use causes Pulmonary hypertension and right heart failure. Q: Propofol should be given with caution in which common allergy? Originally propofol was launched 32 years ago but was withdrawn from the market due to reports of anaphylactic reactions. It was re-launched in 1986 by AstraZeneca with the brand name Diprivan with preparation containing 10% soybean oil and 1.2% purified egg lecithin, a phosphatidylcholine found in egg yolk. A history of egg allergy does not necessarily contraindicate the use of propofol. Most egg allergies are related to a reaction to the egg white (albumin) and not to the egg yolk (lecithin). This could explain why 'propofol' is only very rarely a problem. However, a patient who has an egg allergy should be carefully questioned. Q: 32 year old female with 12 weeks of pregnancy presented with right lower quadrant pain with rebound tenderness. There is a huge clinical suspicion of Acute appendicitis. What should be the management approach beside starting full coverage antibiotics? Answer: According to the 2010 Society of American Gastrointestinal and Endoscopic Surgeons (SAGES) guideline, laparoscopic appendectomy is suitable in suspected appendicitis in pregnant women. Overall, The SAGES guideline states that the laparoscopic approach should be preferred in women of childbearing age with presumed appendicitis. Diagnostic laparoscopy can be performed only to confirm the diagnosis of appendicitis. If findings are positive, definitive surgical treatment should be performed. Perforation may increase the fetal and maternal morbidity. Therefore, aggressive management of the appendix is warranted in pregnant patients. Advantages of laparoscopic appendectomy include increased cosmetic satisfaction, a decrease in the postoperative wound-infection rate, shortens hospital stay and convalescent period compared with open appendectomy. Disadvantages of laparoscopic appendectomy are increased cost and an operating time approximately 20 minutes longer than that of an open appendectomy. Q: 62 year old male with history of Acute Intermittent Porphyria (AIP) presented to ER with chest pain. While awaiting to go to cardiac cath. patient went into ventricular fibrillation. Which one antiarrhythmic medicine is contra-indicated or at least should be given with extreme caution? Contraindications for the use of lidocaine include history of Porphyria, especially acute porphyria. Lidocaine is known to be porphyrogenic. Q: Ventricular fibrillation caused by Digitalis toxicity is best responsive to(Choose one)? Interestingly, electrical cardioversion is generally not indicated in ventricular fibrillation caused by digitalis toxicity. On the contrary it is found to increase the dysrhythmia in digitalis toxicity. Similarly, is the case with amiodarone. Lidocaine is a better choice in known ventricular fibrillation caused by digitalis toxicity. Digibind is an antidote for Digitalis but not an antiarrhythmic agent. Q: 52 year old male with ESRD presented to hospital with Respiratory failure and hypotension. Patient was intubated in field. In ER patient found to have complete heart block. ER physician emergently inserted intravenous pacemaker which stabalizes hemodynamics. On clinical exam, patient is unresponsive and have lost of reflexes. Labs showed abnormalities but most pronounced was Magnesium level of 17.0 mEq/L. You gave intravenous calcium. What should be the next step? Magnesium has fairly good therapeutic margin but hypermagnesemia is a risk in some patients particularly Renal failure. Mild hypermagnesemia may cause weakness, nausea, vomiting and mild hypotension but progressively it can become life threatening. Following is the ballpark clinical signs/symptoms depending on magnesium level. Above 13.0 mEq/L - cardiac arrest/Asystole. Mainstay of treatment is withdrawing magnesium supplementation, Intravenous calcium, diuretics and in severe cases dialysis. Q: Which anti-seizure medicine could be an adjuvant treatment in Central DI (Diabetes Insipidus)? Primary treatment for Central DI is desmopressin. Carbamazepine, an anti-convulsive medication, has also shown some postive effect in this type of DI. Though the data is old but it is still a valid option, if required 1. It can also be used in gestational DI. 1. Wales JK., Treatment of diabetes insipidus with carbamazepine. Lancet. 1975 Nov 15;2(7942):948-51. Cryoprecipitated is the cold-insoluble portion of plasma that precipitates when FFP has been thawed between 1-6C. It is extremely rich in fibrinogen and factor VIII. It also contains von Willebrand factor (vWF) and factor XIII. Dabigatran (Pradaxa) is an direct thrombin inhibitors oral anticoagulant. It is an alternative to warfarin. It has huge advantage as it does not require frequent blood tests for INR monitoring. Half life of Dabigatran is 12-17 hours. In event of bleeding, f extreme aggressive treatment is needed, Dabigatran is dialyzable. Early Tracheostomy in Trauma patients? Background: The influence of tracheostomy timing on outcome after severe head injury remains controversial. Methods: The investigation was based on data prospectively collected by the Pennsylvania Trauma Society Foundation statewide trauma registry from January 1990 until December 2005. Results: 3,104 patients met criteria for inclusion in the study (GCS less than/= 8 and tracheostomy). Early Tracheostomy Group (ETG) patients, defined as tracheostomy performed during hospital days 1–7, were more likely to be functionally independent at discharge (adjusted odds ratio (OR) 1.45, 95% confidence interval (CI), 1.16–1.82, P = 0.001) and have a shorter length of stay (adjusted OR 0.23, 95% CI, 0.20–0.28, P less than 0.0001). However, Late Tracheostomy Group (LTG) patients, defined as tracheostomy performed more than 7 days after admission, were approximately twice as likely to be discharged alive (adjusted OR 2.12, 95% CI, 1.60–2.82, P less than 0.0001). Using a Composite Outcome Scale, which combined these three measures, there was a non-significant trend toward a higher likelihood of a poor outcome in LTG patients. When this analysis was repeated using only those patients in relatively good condition on admission, LTG patients were found to be approximately 50% less likely to have a good outcome (adjusted OR 0.46, 95% CI, 0.28–0.73, P = 0.001) when compared to ETG patients. Conclusions: These results indicate a complex relationship between tracheostomy timing and outcome, but suggest that a strategy of early tracheostomy, particularly when performed on patients with a reasonable chance of survival, results in a better overall clinical outcome than when the tracheostomy is performed in a delayed manner. Q: Give 5 causes of "Nontraumatic" Chylothorax? Role of rTPA in Frostbite! Thrombolytic therapy will decrease the incidence of amputation when administered within 24 hours of exposure. One study published in 2007 from University of Utah, Salt Lake City 1. 32 patients with (frostbite) digital involvement (hands, 19%; feet, 62%; both, 19%) were identified. Seven patients received tPA, 6 within 24 hours of injury. The incidence of digital amputation in patients who did not receive tPA was 41%. In those patients who received tPA within 24 hours of injury, the incidence of amputation was reduced to 10%. Authors concluded that Tissue plasminogen activator improved tissue perfusion and reduced amputations when administered within 24 hours of injury. 1. Reduction of the Incidence of Amputation in Frostbite Injury With Thrombolytic Therapy - Arch Surg. 2007;142:546-553. 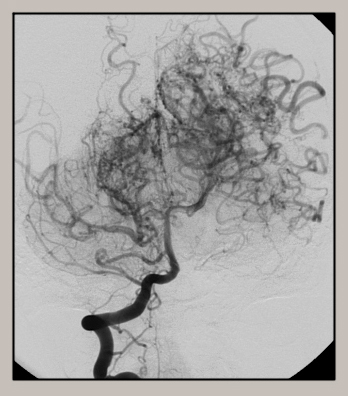 Moyamoya disease is a progressive cerebrovascular disease in certain arteries in the brain are constricted causing stroke. The name “moyamoya” means “puff of smoke” in Japanese. See the appearance above of Angiogram. Q: Which lab is most reliable in following the effect of plasmapheresis in resolution of TTP (Thrombotic thrombocytopenic purpura)? Declining LDH level is a pretty good indicator that plasma exchange is working to treat TTP. Q: What is the recommended dose of Solu-Medrol in DIFFUSE ALVEOLAR HEMORRHAGE? Corticosteroids and immunosuppressive agents are the gold standard for this disease. Factor VII has recently shown promising results. Recommended dose of intravenous methylprednisolone (Solu-Medrol) is up to 500 mg every 6 hours for 5 days, followed by a taper to a maintenance dose. Though higher and lower doses have been described too. Also, Plasmapheresis and intravenous immunoglobulin therapy should be considered too in cases related to vasculitis. Q; Is Digoxin a diuretic? Q: What is postictal bliss? Answer: Postictal bliss (PB) is a highly blissful feeling associated with amnesia following seizures. BACKGROUND: The authors reappraised the conventional wisdom that the intubating dose of succinylcholine must be 1.0 mg/kg and attempted to define the lower range of succinylcholine doses that provide acceptable intubation conditions in 95% of patients within 60 s.
METHODS: This prospective, randomized, double-blind study involved 200 patients. Anesthesia was induced with 2 mug/kg fentanyl and 2 mg/kg propofol. After loss of consciousness, patients were randomly allocated to receive 0.3, 0.5, or 1.0 mg/kg succinylcholine or saline (control group). Tracheal intubation was performed 60 s later. A blinded investigator performed all laryngoscopies and also graded intubating conditions. RESULTS: Intubating conditions were acceptable (excellent plus good grade combined) in 30%, 92%, 94%, and 98% of patients after 0.0, 0.3, 0.5, and 1.0 mg/kg succinylcholine, respectively. The incidence of acceptable intubating conditions was significantly greater (P less than 0.05) in patients receiving succinylcholine compared with those in the control group but was not different among the different succinylcholine dose groups. The calculated doses of succinylcholine (and their 95% confidence intervals) that were required to achieve acceptable intubating conditions in 90% and 95% of patients at 60 s were 0.24 (0.19-0.31) mg/kg and 0.56 (0.43-0.73) mg/kg, respectively. CONCLUSIONS: The use of 1.0 mg/kg of succinylcholine may be excessive if the goal is to achieve acceptable intubating conditions within 60 s. Comparable intubating conditions were achieved after 0.3, 0.5, or 1.0 mg/kg succinylcholine. In a rapid-sequence induction, 95% of patients with normal airway anatomy anesthetized with 2 mug/kg fentanyl and 2 mg/kg propofol should have acceptable intubating conditions at 60 s after 0.56 mg/kg succinylcholine. Reducing the dose of succinylcholine should allow a more rapid return of spontaneous respiration and airway reflexes. Optimal dose of succinylcholine revisited., Anesthesiology. 2003 Nov;99(5):1045-9. Q: After inserting central venous catheter, you have hard time (resistance) to flush the distal lumen; Also you have poor venous backflow from the distal lumen; What should be your first thought? The first thing before you cannot find guide wire or find it on CXR, would be a resistance to injection via the distal lumen and poor venous backflow from the distal lumen. Lost guidewire during CVC insertion is a very under-appreciated complication and happens more frequently than thought. Loss of the guide wire: mishap or blunder? - Br. J. Anaesth. (2002) 88 (1): 144-146. Q: Half life of Cisatracurium (Nimbex) is prolong in? Half life of Nimbex is approximately 22 to 29 minutes, following administration of a single intravenous dose. The half-life is not substantially affected by the duration of administration (approximately 26 ± 11 minutes in ICU patients receiving cisatracurium via intravenous infusion), type of anesthesia, or hepatic or renal function impairment, but is slightly longer in geriatric patients than in younger adults. In individuals undergoing induced hypothermia (body temperature of 25 to 28 °C), the half-life is prolonged as compared with the half-life during normothermia. Mnemonic to remember the causes of the oxygen dissociation curve to Right!